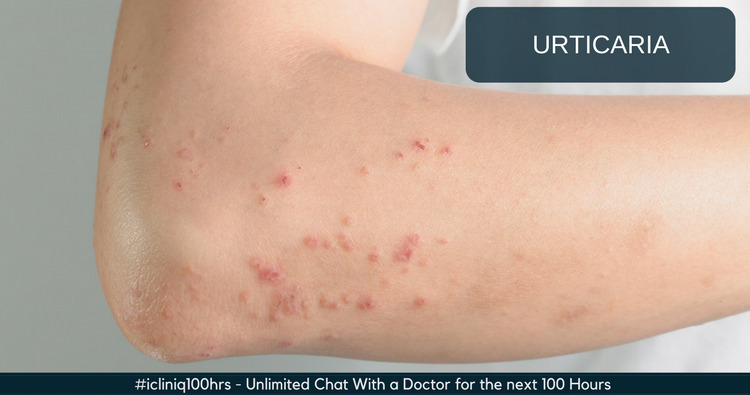 Urticaria is a skin disease consisting of a wheal and flare reaction. In urticaria, the localized wheal is surrounded by an area of redness that is typically itchy. In case of hives, a local increase of the permeability of the capillaries and small venules result in transient, erythematous or edematous swelling of the dermis or subcutaneous tissues. Cutaneous hives may last for 30 minutes to 24 hours. If in an individual, the wheals or hives persist for more than 24 hours and also have joint pain and bruising, then it should be considered urticarial vasculitis. Systemic symptoms like rhinitis, difficulty in breathing, sensation of heaviness in the chest, wheezing and abdominal pain may accompany the skin lesions and are indications for urgent treatment to avoid the complication of laryngeal edema. Why am I getting severe itchy skin eruptions? Potential mediators of urticaria include histamine, prostaglandin D2, platelet activating factor, bradykinin, etc. Urticaria can be classified into acute and chronic. Acute urticaria is usually IgE mediated. The duration is less than 6 weeks. It occurs due to various foods, drugs and infection. Chronic urticaria lesions continue to appear in an individual for at least twice a week for more than 6 weeks due to vasculitis, physical and autoimmune causes, etc. Physical factors account for 20% of cases. They are stroking (dermographism), constant pressure like prolonged sitting on a chair or tight belt, vibration like kitchen grinder or blender, cholinergic like emotion, exercise, cold and aquagenic such as urticaria after swimming. Medications such as Aspirin, NSAIDS (nonsteroidal anti-inflammatory drugs) like Brufen (Ibuprofen), Combiflam (combination of Ibuprofen and Paracetamol), Penicillin, Codeine, Morphine, ACE inhibitors (Envas - Enalapril). Foods and food additives can cause urticaria. For example, foods such as shellfish, eggs, nuts, strawberries, etc., and additives like tartrazine, azo dyes, hydroxyl benzoates, etc. Inhalants such as grass pollens, animal danders, tobacco smoke and house dust. The contact urticaria syndrome mainly due to latex, caterpillars, animals and plants. Arthropod assaults like insect bite is the most important cause for popular urticaria. Infections of bacteria, viral, candidial and protozoal can also be the cause. General medical disorders such as hypo or hyperthyroidism, lymphoma, polycythemia, lupus erythematosus, pruritic urticarial papules and plaques of pregnancy. Psychogenic causes and genetic causes like hereditary angioedema. In all patients a detailed history gives better yield as regards the cause than a battery of investigations. Provocative tests for physical urticarias like ice cube test for cold urticaria, exercise test for cholinergic urticaria, stroking for dermographism, etc. In selected patients, the need will arise to check the following blood tests. Complete blood count, ESR (erythrocyte sedimentation rate), urine analysis, stool examination for ova and cyst, blood chemistry profile, ANA (antinuclear antibody), hepatitis B and C antigens and antibodies, thyroid antibodies, cryoglobulins, CH 50, hereditary C1 esterase deficiency, plasma and erythrocyte protoporphyrins (solar urticaria), skin biopsy in urticarial vasculitis and IgE and IgE receptor antibody assay. H1 Antihistamine is the initial line of treatment. During daytime Loratadine, Levocetirizine and Fexofenadine and at night-time Hydroxyzine or Cyproheptadine is used because of the sedation. Corticosteroids are useful in case of acute urticaria for short duration. It is rarely used in chronic urticaria. Mast cell stabilizers like Ketotifen 1-2 mg daily or Cromolyn sodium inhaler and Montelukast (leukotriene receptor antagonist) are useful in case of recalcitrant disease. In case of autoimmune urticaria, Cyclosporine 2 to 2.5 mg/kg daily for two to three months or IVIG (intravenous immunoglobulin) or plasmapheresis is the treatment. For angioedema, the treatment is same as above, along with Epinephrine 0.5 to 1 mg IM (intramuscular) in case of acute episodes and repeat every 10 to 15 minutes till remission or Ephedrine 2% aqueous spray two to three puffs for regular use in chronic cases. Avoidance of precipitating or provoking causes is curative in case of urticaria. Do you have a question on Urticaria or Cholinergic Urticaria? I have a rash on my back which gets aggravated when I am in stress.What could it be?